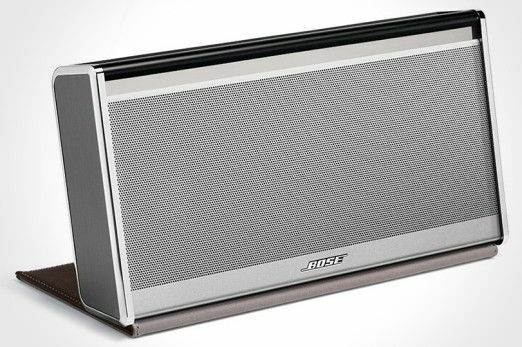 The Bose SoundLink Wireless Mobile Speaker's impressive audio quality and a detailed feature set do come at a price. But then again, this is the ultimate package in its area of expertise! In what world would you expect a lot from a small speaker that boasts of Bluetooth capabilities? Well, you can, and you should, if you live in the same world as Bose! This tiny speaker with a truly long name does have a very impressive feature set. How does that translate into real life performance? Let us find out. Bose has integrated the protective case as well as the stand quite uniquely. And they are available in nylon and leather versions. Both are sold as different versions of the same product, with a price difference as well. The design is simple, with no unnecessary design elements integrated. The top has all the controls, clearly marked and the buttons are quite big as well. The specific number of buttons there proves the keep-it-simple approach - power, Bluetooth, AUX, volume up/down and mute. Just above the speaker grille is a later of LEDs indicating the connectivity source, Bluetooth pairing status, power and battery status. Flip the SoundLink Wireless Mobile Speaker over, and there you have the power/charging port and the 3.5mm jack for AUX sources. The case (leather in the case of our review unit) protects the silver aluminum grille when the speaker is turned off, and can be flipped open to go beneath the speaker and act as a stand. Works well. However, with that stand, you have to ensure enough space as a footprint for the speaker to sit on, with the stand. While it isn't exactly featherweight, at 1.3kg, we think that is not a lot considering it has a built-in battery as well as dual subwoofers. Quite an impressive set to talk about. First, the built-in battery offering anywhere between 4 hours and 8 hours of music playback reaffirms the portability factor. Secondly, the form factor of 13cm x 24.4cm x 5cm ensures that while it has enough bulk to offer audio punch, it still remains very much portable. Setting up a Bluetooth pair is very simple. Press the Bluetooth button for a few seconds, and the moment the indication starts to pulsate, the device is ready for detection. The Bluetooth functionality ensures that do not need to hook up gadgets using the usual audio cables. We connected the iPod Touch, the MacBook Pro, a Blackberry and a couple of other phones as well, and the connectivity was seamless. The only issue we faced was with a Windows 7 based laptop, since it had some issue with the Bluetooth drivers, not Bose’s fault by any stretch of the imagination. The SoundLink can remember up to 6 devices paired with it, which means you can switch between devices and be listening to tunes once again in about a minute’s time. The wireless range is largely dependent on the placement of the walls. In a straight-ish line, you can even control playback from another room. The audio quality was much better than expected. We did have some apprehensions due to the size of the speaker, but after the first few minutes of listening to the tunes, those apprehensions were shattered completely. The clarity and loudness was quite amazing, and this one has more than enough punch to be clearly audible in a room as big as a large sized living room, let alone a small bedroom. 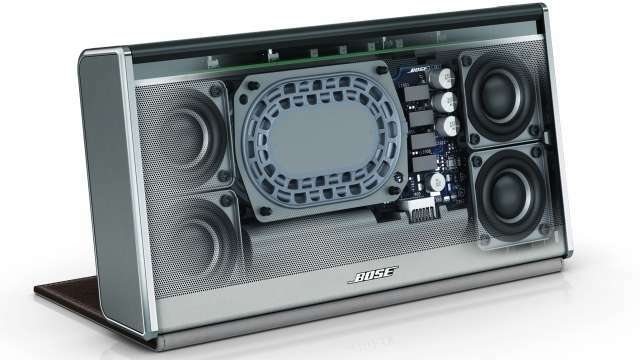 The bass thump was the most surprising bit, and the dual opposing subwoofers do their job well. Two is clearly better than one, if you are a bass addict. In this case, the opposing bit has been crucial, since it is removing the vibrations we normally associate with bass. That does two things - helps remove unnecessary disturbance/noise in the music, and makes the bass clearer. Since almost any speaker will sound good with a good quality MP3, we decided to put it through a real test - the All India Radio type! Connected the SoundLink to a conventional radio set, via the AUX route. We must say that radio has never sounded so good, ever. So much so that even my grandmother sitting in the next room commented that she could hear the lyrics of that old song very clearly. Just goes on to show the focus on clarity as well as that this tiny speaker does pack a punch. There are four neodymium drivers in this system. The battery backup essentially depends on the volume at which you listen to music, but we managed to get anywhere between 4 hours and 8 hours of battery time between charges. For a portable device packing so much punch in a small form factor, that makes for good reading. Look, there is no doubt that this is on the expensive side. But then again, it is miles ahead of any rival, both in terms of performance as well as the quality of the product. You have two versions available for this one, with the only differences being the material used for the case/stand and the colour of the panel.